Who doesn't love a good bowl of ice cream or a creamy delicious popsicle? 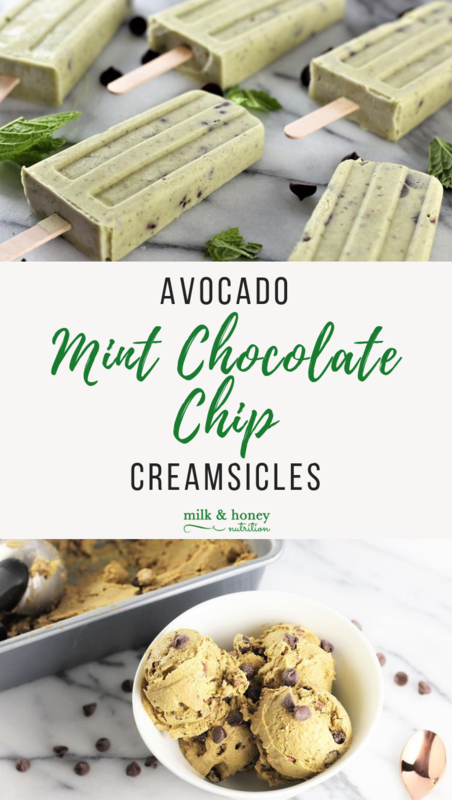 This recipe for Avocado Mint Chocolate Chip Creamsicles is the perfect guilt free summertime treat! There's no added sugar, just the natural sweetness of medjool dates. And tons of healthy fat courtesy of those creamy avocados. And you can't beat the creamy richness of coconut cream, and the authentic flavor of fresh mint (compared to the fake mint flavor found in most store bought ice creams). This is also a great activity to do with young ones in the kitchen. Or a fun way to impress loved ones at a family gathering! You can make creamsicles as directed or follow the instructions below for making ice cream without an ice cream maker. Remove the cans of coconut cream from the refrigerator. Scoop the thick cream into a high powered blender or food processor, leaving the water-y liquid in the cans. Add the remaining ingredients, except chocolate chips, and blend until smooth. Mix in the chocolate chips by hand. For Creamsicles: Pour the mixture into popsicle molds and freeze for at least 3-4 ours before eating. Combine medjool dates and water in a small saucepan and bring to a boil. Let boil for 10 minutes with lid on. Remove from heat and let it cool for 10-15 minutes. Place medjool dates and 1/4 cup of liquid in food processor and process until smooth. (You may need to stop and scrape down the sides 1-2 times.) Store in a small mason jar or another container with a lid for up to 7 days.